About 130 migrants from Central America have arrived at the United States border with Mexico seeking asylum. The group has been called a “caravan” and it has been sharply criticized by U.S. President Donald Trump and other U.S. government officials. The Associated Press, or AP, reports that two buses, carrying mostly women and children, arrived late Tuesday in the Mexican border city of Tijuana. They stopped at two migrant shelters close to the border. U.S. lawyers planned to lead informational meetings later this week on U.S. asylum law. They will tell the immigrants what to expect when they seek asylum. The first groups plan to try to enter the U.S. on Sunday at a border crossing near San Diego, California. Trump and other officials have described the caravans and asylum seekers as evidence that security at the border with Mexico is a serious problem. The president tweeted this week that he opposed permitting such groups into the country. 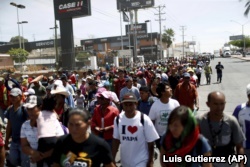 Central American migrants traveling with the annual migrant Stations of the Cross caravan march for migrants' rights and protest the policies of U.S. President Donald Trump, in Hermosillo, Mexico, Monday, April 23, 2018. Activist organizations have used caravans for years to bring attention to the issue of Central American asylum-seekers. Many migrants travel to the U.S. hoping to receive asylum. They say they are escaping political persecution or threats from criminal gangs. 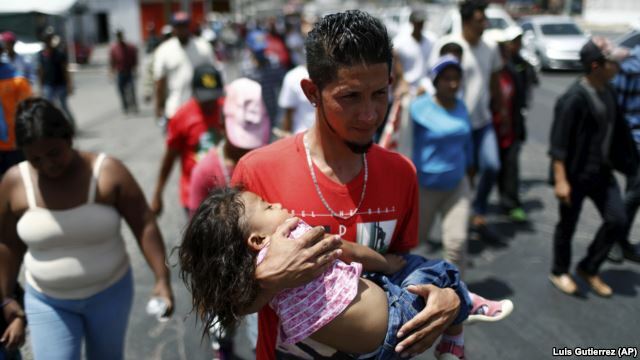 The latest caravan began on March 25 in the Mexican city of Tapachula, near Mexico’s border with Guatemala. It has received the most attention since the president has said the group’s efforts are an example why a border wall is necessary. The asylum-seekers said they plan to turn themselves in to U.S. officials at the border. Taxi driver Jovanne Torres is from El Salvador. He arrived in Tijuana on Tuesday. He told the AP that the U.S. president’s criticism of the caravan makes him believe he will not get asylum for himself, his wife and his two young daughters. But he still plans to try. Central American mothers and children who are traveling with a caravan of migrants, wait to figure out their night's accommodations at a shelter after arriving to Tijuana, Mexico, Wednesday, April 25, 2018. Torres said he fled his hometown near the city of San Salvador and joined the caravan after a gang threatened to kill him and his wife. He said this was because he had refused to give a free ride to a gang member. He said he could be killed if he goes home, and wants to join family members in Houston. “Trump’s words have made it difficult for us,” he said. This caravan’s numbers are relatively small. However, in 2014, about 200,000 people were arrested at Mexico’s border with the state of Texas in the Rio Grande Valley. And in 2016, thousands of Haitians seeking to enter the U.S. turned themselves in to U.S. border agents at the Tijuana-San Diego border crossing. The San Diego border crossing was overwhelmed by Haitians. U.S. officials then worked with Mexican border officials to create a ticketing system. This let the Haitians in over time. 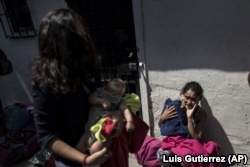 Some waited their turn in Tijuana for more than five weeks. Pete Flores is director of the San Diego field office of the U.S. Customs and Border Protection. He says his office has space to hold about 300 people at the crossing. Then, asylum-seekers are sent to U.S. Immigration and Customs Enforcement. Officials of that agency decide if people should be held for a longer period or if they can be released until their trial date. 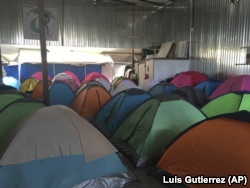 Temporary tents for about 130 Central Americans, mostly women and children, who arrived at the U.S. border with Mexico. Asylum-seekers first need to establish with asylum officers that they have a “credible fear” of returning to their homeland. If they pass, they are permitted to enter the U.S. and face a sometimes long process before U.S. immigration judges. Homeland Security Secretary Kirstjen Nielsen said Wednesday that anyone who makes false claims to immigration officials could face criminal prosecution. She said that is the case for anyone who helps immigrants to make false claims. The secretary also said asylum seekers in the caravan should seek protection in the first safe country they reach. That includes Mexico, she said. Elliot Spagat reported this story for the Assoicated Press. Phil Dierking adapted the report for Learning English. Mario Ritter was the editor. What is the policy for asylum seekers in your country? Write to us in the Comments Section or on our Facebook page.